Unlike most sports, swimming doesn’t require much in the way of equipment. Swimmers typically take to the pool for competitions in a swimsuit, goggles and a swim cap. Yet during practice, swimmers often wear extra accessories, like swimming gloves, to assist with their training. Wearing gloves can provide swimmers with a number of benefits, improving overall health, fitness and performance. Swimming gloves come in a variety of styles, although they all share the same basic feature of webbed fingers. Some gloves have stiff webbing to keep the fingers spread wide, while other models feature thin rubber webbing to allow the fingers to open wide or close into fists. 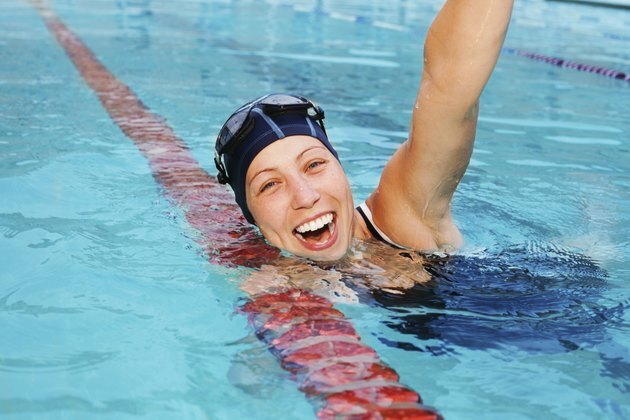 Manufacturers make swim gloves from lightweight, water-resistant materials like Neoprene or thin, skintight rubber. Gloves may feature closed fingers or open tips, which allow water to pass through without collecting in the gloves. Swimmers wear gloves during training to increase water resistance, with the webbed fingers spreading wide to create more drag. The added resistance provides more work for the upper body, giving the shoulders, arms, chest and back an intense workout and toning muscles well beyond normal swimming. Even the legs are forced to kick harder to propel the body, toning the thighs, hamstrings and calves. Training with swim gloves builds strength and, in turn, improve a person'ss swimming stroke, creating smoother movement and enhanced technique for better in-pool performance. Aside from strengthening muscles, swimming gloves force the entire body to work harder to fight through the added water resistance, intensifying an already effective aerobic workout. Sustained training with swim gloves will result in increased endurance, since the body’s cardiovascular system adapts to the stress placed on it due to the fierce resistance. The more intense workout will elevate heart rate, fatigue muscles and prepare the body to drive harder and longer during competition. Swimming with water gloves pushes more water with each stroke and increases propulsion and the speed of forward movement. This added propulsion can be particularly beneficial when you perform water aerobics, helping keep the body afloat and in proper position to do the required exercises. The added propulsion during regular swimming movements also can acclimate the swimmer to moving through the water with greater speed, which may help achieve improved swimming speed without the gloves.